Home Bomb blasts Kerala State Around 86 people dead after explosion during fireworks display at Puttingal temple in Kollam, Kerala. 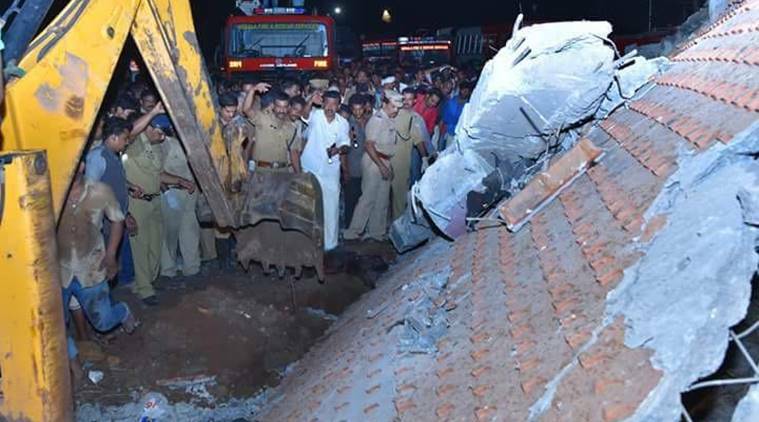 Around 86 people dead after explosion during fireworks display at Puttingal temple in Kollam, Kerala. The fire started about 03:30 (22:15 GMT Saturday) when an explosion was set off in a store of fireworks ready for celebrations of a local Hindu new year festival, local media reports say. A building at the temple then collapsed, causing many of the fatalities. More than 200 are injured. Indian Prime Minister Narendra Modi is travelling to the scene. He tweeted that the accident was "heart-rending and shocking beyond words". Those with most serious burns injuries are being treated at the government medical college in Thiruvananthapuram, the state capital. The impact of the blast was felt in houses up to a kilometre away. "Huge pieces of concrete were flying through the air. Chunks landed in our yard," said resident Jayashree Harikrishnan. Kerala's Home Minister Ramesh Chennithala has ordered in an investigation into the accident. "The temple holds an annual firework display every year. We're doing our best to rescue those still trapped," said Mr Chennithala. "Now the situation is under control... the police are on the spot." Kerala Chief Minister Oommen Chandy is also due to visit the scene this morning. The fireworks had been stored ready for celebrations on Thursday of Vishu, a Keralan festival marking the Hindu new year. Local reports say that police had not given permission for Puttingal temple to hold the fireworks display. The police are reportedly taking action against the temple administration and the contractors who were putting on the firework display. Fireworks and firecrackers are commonly used at temple festivals and other public events and accidents are not uncommon.